Although officially an unincorporated area, Dunthorpe is usually treated as another of Portland's neighborhoods or outlying suburbs. 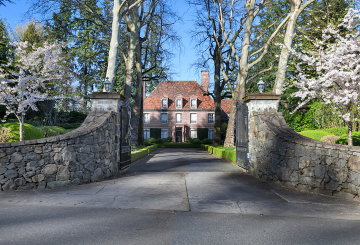 Dunthorpe is mostly hemmed in by the Willamette River and by busy Highway 43, stretching from Lake Oswego to the south and Portland to the north. Just like its neighbor LO, Dunthorpe is an affluent community with large, beautiful houses and wild areas. Its homes and streets sit half in Clackamas County and half in Multnomah County, and its properties are zoned to mandate half-acre lot size at a minimum. Dunthorpe contains within its embrace Lewis & Clark College and Law School as well as gorgeous, rambling Tyron Creek State Natural Area. Technically a state park, Tryon Creek boasts miles of wilderness trails for hikers, cyclists and horseback riders, and is home to wildlife such as coyotes, brush rabbits, raccoons and endangered salamanders. Dunthorpe is situated on the Willamette River's west side, on 13 acres of which sits the Elk Rock Gardens of the Bishop's Close. Created at the turn of the century by a Scottish couple, Mr. and Mrs. Peter Kerr, and designed by Central Park architect Frederick Law Olmstead, the garden now showcases curated paths, magnolia trees, streams, rock gardens, rhododendrons and much more. Although the area originally only contained an elementary school, it now provides Kindergarten through 12th grade education for its inhabitants. Located next to the river, Dunthorpe is convenient to many water sports as well as walking along accessible parts of the waterfront.